Petroleum is a good business to be in. Crude prices have been firmly on the rise over the past three years. And even with the drop in price for U.S. West Texas Intermediate crude (WTI) in the fourth quarter of 2018, prices are still amply above lows in 2016 by 204.85%. And while prices may still remain volatile, there are fundamental conditions that should support more favorable market conditions for energy stocks. For overall demand for crude has remained on the rise. And suppliers around the globe are limited in being able to keep up. With major producers, including Venezuela, Iran and Libya (or what’s left of it) experiencing domestic crises, there is only so much oil that can be pumped. Even Saudi Arabia has limited additional lift capacity, given its existing field operations and capabilities. 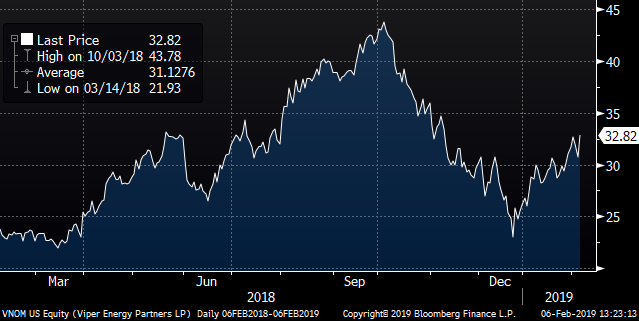 No matter the conditions of the fundamentals, the petroleum market has been nothing but unsettled over the past few months, as many factors have impacted pricing. It starts with the U.S. stock market, which took quite a spill through the fourth quarter of 2018. This despite continuing good economic news from jobs and consumer spending to business investment — stocks have been sold off largely with fear of a slowing in profits growth for 2019. Crude oil took a page from that book of diminished expectations and traders hit the sell button sending crude down in the U.S. market with West Texas Intermediate hitting a low on Dec. 24 of $42.53 a barrel. And then there is the overall supply-and-demand arguments. 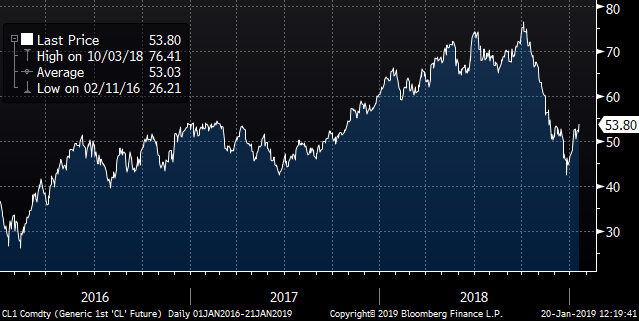 With slowed U.S. profit expectations for companies, it’s been argued that demand globally will ebb for crude, sending prices lower including for global oil as measured by Brent crude falling to a low of $50.47 a barrel. On the supply front, the Organization of Petroleum Exporting Countries (OPEC) plus Russia (OPEC+) came to an agreement of cutbacks in production. This was initially met with skepticism only to recently be proven with shipping reports confirming compliance with cutbacks particularly from Saudi Arabia. Crude oil in the U.S. WTI has since rebounded by 26.99% to a current $54.01 with Brent rallying by similar gains to a current $62.57. 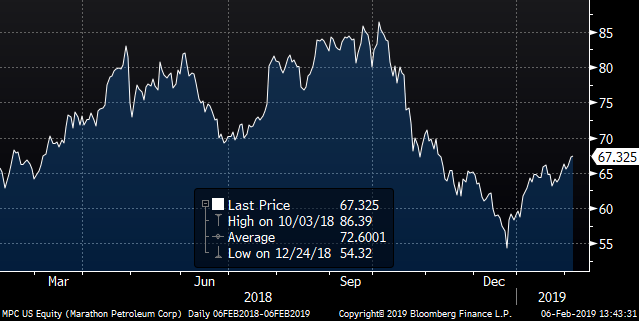 Meanwhile, natural gas after surging and giving back some gains with colder weather in the U.S. is now further rising to a current $2.69 per million British Thermal Units (MBTU), which is significantly up from the lows of last year by 5.49%. There are three ways to play the petrol market for dividends. Upstream with production, downstream with refineries and the midstream of pipelines. I’ll start upstream with petrol production with my favorite bigger dividend-paying petrol company. This company is not a producer or a toll-taking pipeline or a refiner – but is merely a landlord for oil and gas-rich land in the Permian Basin of the U.S.
As such, it leases out land parcels to exploration and production companies (E&P) and in turn collects rent as well as royalty income from oil and gas produced from its lands. The stock was on a nice ascent until the general stock market slump in the fourth quarter noted above. But since Dec. 24, the stock has rallied so far by 27.58%. Meanwhile, there are been numerous heavy hedge fund and other fund investors buying into the company. And this came on the buying of thousands of additional shares by the President and COO of Diamondback Energy (NASDAQ:FANG), which has a significant ownership stake in this landlord company as it was formed in a drop-down transaction from Diamondback’s property and other assets. This landlord of a company, of course, does derive some benefits on the general price of oil and gas as it impacts the value of its royalty payments. But at the same time, since it doesn’t need to commit capital for field development and equipment repair, it doesn’t need to worry about cashflow levels – only that cash comes in. As such it doesn’t need to hedge against oil and gas prices … which hurt costs. It has piles of cash on hand, virtually no debt and over the top returns on equity and its capital base of land and other assets. Viper Energy (NASDAQ:VNOM) was set up as a passthrough limited partnership when it went to the public market in 2014. It was created by Diamondback Energy to hold petroleum properties in the U.S. as noted above. The transaction is known as a drop-down, as Diamondback contributed some initial oilfield assets and the IPO raised addition capital to acquire still more. In turn, Diamondback holds shares in Viper and is the contracted operator of some of Viper’s properties. Diamondback simplifies its asset mix and allows the market to better value the rich and easily recoverable petroleum reserves in the Permian Basin and receives dividends just like shareholders in Viper. What sets Viper apart is that it largely does not operate or develop its field assets. It mainly collects the royalties from companies and operators in working interest contracts. This means that Viper has less need for heavy capital investment in equipment and services. This frees it from having to constantly budget for development and maintenance. Instead, Viper focuses on keeping an eye on its working interest while looking to expand those interests from existing assets or by acquiring additional assets. This business model means investors get the benefit of revenue from oil and gas production as well as the rising future value of the underlying field asset reserves. Most of Viper’s holdings are located in the West Texas Permian Basin, the shale oil-producing region that already produces more oil than Kuwait or Mexico and could soon surpass Iraq and Canada. It’s the core of the U.S.’s newfound status as an oil superpower—preliminary numbers already suggest that the U.S. has produced more oil so far in 2018 than any other country. And in recent reports from the U.S. Energy Information Agency (EIA) – the US is now producing record daily production. And in turn, it could eventually produce more oil than Saudi Arabia and Russia combined. In May of 2018, Viper changed from a passthrough to a regular corporation. Many former passthroughs have done this in order to attract more institutional and fund investors, who often have limits on how much they can have invested in passthroughs. The change also provides the opportunity to increase Viper’s investments in further field assets over time, providing growth opportunities for investors. This is exactly what the company has done over 2018 by investing $615 million in additional royalty interests. Oil production continues to advance, with projected oil and gas equivalents seeing gains of 34% for 2018 over 2017 and gains of over 311% between coming to the market from 2014 to the end of the first quarter of 2018.. The company has over 100,000 acres, with a fraction of that in current production. This means more potential for even higher growth rates in production, resulting in even higher royalty cash payments. And even though it is converting to a corporation, it has ample trailing tax deductions that will continue to shield regular qualified divided payments with return-of-capital distributions. Revenues over the trailing year, with higher petrol prices, are up 117%. But even with prior years’ lower petrol prices, the three-year average shows gains running at 30.30%. The other key thing about Viper is that it does not hedge against oil and gas price fluctuations. Because it doesn’t have to worry about capital expenditures on equipment, it doesn’t need to be as worried about prices. This means that it is a very pure play on petroleum prices. Given the structure of the company, margins are very fat, with operating margins running at 66.20%. Return on assets is at 14.80%. Viper has piles of cash, with a current ratio of cash against near term liabilities of 9.9 times. Its debts are low, at only 9.20% of assets—primarily these are used to fund its operations more smoothly as needed in between new acquisitions and further development of working interest operators. The dividend yield is at 6.20%, paid quarterly, and the dividend has been rising over the past three years by an average of 35.09% and by 72.50% over the past trailing year alone. Viper’s stock is also a pretty good value right now., based on its current price-to-book ratio of 2.97 times. And that underlying value of the book of assets is up this past year by 43%. And with much of its field assets yet to be developed, there is a lot more value to the underlying company. Next up is the downstream of the petrol market in refining. This is where my favorite Marathon Petroleum (NYSE:MPC) is one of the best in the market. This company recently completed its acquisition of Andeavor to become a major national refinery. It is now pulling crude from around the U.S. and Canada for its refinery operations increasing its discounted feedstock crude costs with the lower-priced North American crude than for imported crude. Marathon’s operating margins are quite good at 6.10% and are up significantly from earlier this year by a factor of 2.63 times better than in the first calendar quarter. This is driving an impressive return on its expensive capital of its refinery and other assets at 14.50%. And for shareholders, the return on their equity is running at 27.40%. Revenue is climbing over the trailing twelve months by 20.00% and this is piping in profits to fund dividends which are up this past year by 21.05% to a current payout of 53 cents equating a yield of 3.15%. Yet, despite the great underlying fundamentals, Marathon’s stock has been deeply discounted. The stock is valued at a discount of 64% of its trailing sales. And the stock’s price to book value has gone from 2.62 times in late September to a bargain buy at only 2.00 times. And remember, refineries are very hard to get permitted so its assets are truly valuable and hard to replicate. 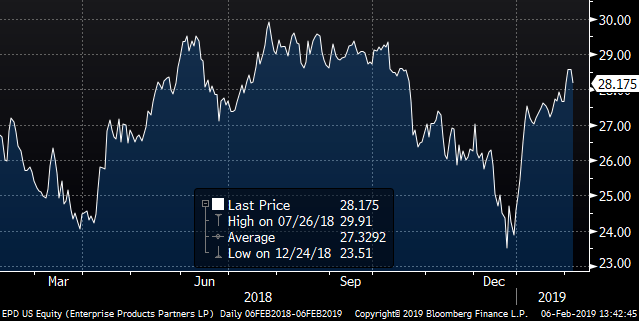 Marathon has less to fear from OPEC and more to capitalize from U.S. producers making it a good dividend paying stock for income and growth over time. Last up is the midstream or toll-taking pipeline companies which is one of the best means to get piped-in dividend payouts. Pipelines are in the midstream of the petroleum market transporting crude oil and natural gas from the upstream producers (such as are operating on Viper Energy properties) downstream to refiners (such as Marathon Petroleum) and other customers as well as transporting refined products to other further downstream end users. This means that they are principally the toll-takers of the petroleum market. They transport petroleum and collect regular fees along the way. And in doing so, they can be resilient in both buoyant petroleum markets and in most less sanguine market conditions. The key, of course, is that successful pipeline companies need to manage two specific components of their businesses. First, they need to manage the volume of petrol flowing through their pipes. Fuller pipes mean fuller coffers and the less that they pipe, the less revenue that they pipe into their quarterly statements. Second, pipeline companies need to manage counterparty risk. Counterparty risk is something that many analysts miss in their assessment of the risks and rewards of pipeline companies. Pipelines are often represented as neutral companies in the petroleum market. Crude oil and soar or plunge in price – and pipelines are supposed to be immune unlike crude and natural gas producers. However, that’s not completely true. If petroleum is high in price, and producers are pumping more oil and gas, pipeline companies need to make sure that they can meet the demand with enough capacity. If pipeline companies don’t meet demand – then producers will seek other alternatives providing potential losses in current and future contracts with pipeline companies. And if petroleum prices fall too greatly and producers limit production, shut-down wells or worse – go under – then pipeline companies can be left with contracts from producers that are worthless leaving them exposed to their own shutdowns or worse. I have three pipeline companies in various parts of the petroleum toll-taker market that make the cut in managing volume and counterparty risks and opportunities while paying out ample dividends to their shareholders. One of my long-term favorites is Enterprise Product Partners (NYSE:EPD) is one of the major owners and operators of one of backbone pipeline networks of America for natural gas and gas liquids as well as crude oil. It has many thousands of miles of pipes that run throughout the core fields of North America including Canada to refiners and petrochemical companies. And it has key crude oil pipes bringing oil from the central hub for American oil in Cushing, Oklahoma down to the gulf for refining and export via its terminals and storage facilities. Revenues continue to be on the rise with the trailing twelve months showing gains of 24.90%. And with great management of its pipeline and related businesses, it has fat operating margins running at 14.80%. This fuels an impressive return on equity for shareholders of 16.10%. And it also manages its risks well and has the capacity to fund further expansion of its network of pipes as well as funding any near term slowing in pipeline flows. Debt to assets is low at 45.10% and its credit is good – especially with a long-term track record of heavy cash generation over thick and thin in the petrol market. The dividend is good at a current 43.5 cents per share or unit for a yield of 6.17%. And it has been boosting its distribution by an average annual rate of 4.72% over the past five years. And it is projected to further increase its next payout with the expected declaration on April 12th of next year. And as a passthrough structured as a limited partnership (LP), the company avoids most Federal Income taxes. And the distributions paid to shareholders are also partially shielded from current Federal income taxes as the company also passes through tax deductions that shareholders use to offset income received. This makes the dividend distributions all the more valuable on an after-tax basis. And it makes for a great long-term shock absorber with great dividends for all portfolios in all market conditions. Article printed from InvestorPlace Media, https://investorplace.com/2019/02/3-energy-stocks-pumping-out-dividends/.